Create a feature entrance to your garden. The rounded rafter and diamond trellis side panels of the Starlight Arch adds a touch of elegance to any garden. Featuring a curved roof and 2 side trellis panels, create an enchanted feel to any walkway, path or entrance. Enjoy this garden classic year after year. 2-Person self -assembly required. Dimensions 1.34m x 0.72m x 2.23m, Weight 35.7kg. 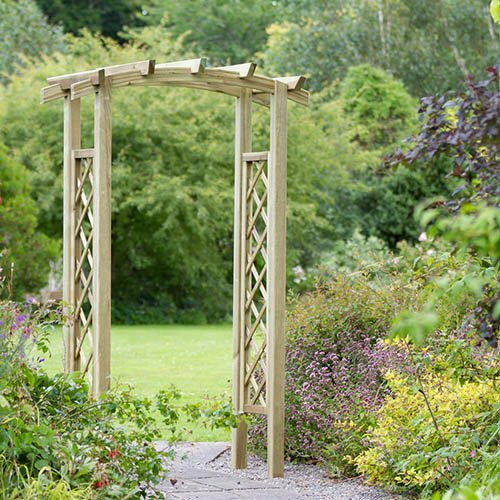 A garden arch is a classic garden feature which adds height and interest to any space. Featuring a curved roof and 2 side trellis panels, the rounded rafter and diamond trellis side panels of the Starlight Arch add a touch of elegance to refine any garden. An arch allows you to grow a different range of plants - Roses, Wisterias, Jasmines and a whole host of remarkable and attractive plants. When covered by your favourite climbing plants, this adjustable arch creates an enchanted feel to any walkway, path or entrance. Starlight Arch 1.34m x 0.72m x 2.23m, Weight 35.7kg. IMPORTANT: This item is delivered directly by our third-party supplier. Note, a valid mobile number and email address are both required to deliver this item. Please provide these when you place your order.